One of the jobs any ISP takes to heart is monitoring how well each of their clients is doing. By so doing some ISP’s develop personal relationship with their clients and then have access to their contact person whom they call in case they notice down time on their link, when such relationship are developed the client most times have a relaxed mind knowing that their ISP get their back always. But apart from this, there is always this issue of am I getting what I paid for ? Am experiencing slow internet and all that kind of complains from clients and when matters like this arise, it take wisdom to handle such, otherwise you might end up losing your clients to another ISP. If you feel boring hearing these questions, which will definitely arise. The only solution you get at this stage is to establish a system where your customer will be able to inspect their personal bandwidth usage, Cacti/MikroTik Graphing is your best answer to all. 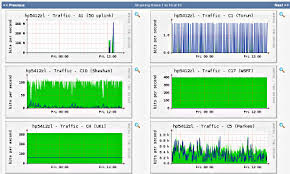 This system Cacti/MikroTik Graphing is used to display graphic real time traffic which is passed through interfaces and simple queues as well as for resource usage (CPU, RAM and Disk usage). MikroTik Graphing method first records bandwidth or resource usage information on memory or on the device’s storage with a time basis and then displays this information in an easy to read graph that can be printed or the web link can be given to a client for his or her own inspection. But before getting these graphs available in your Winbox or web interface, you must first configure MikroTik Graphing properly. So let us get in details of how to configure MikroTik Graphing for recording MikroTik bandwidth and resource usage information and displaying recorded information in an easy to read graph through Winbox or the web interface. The graphing of customers or client is done after the installation and the link is up and running, at this point all initial configurations are done and there is internet on the link with interface queues and a well configured IP address. CPU, RAM and Disk usage. So, in Graphing we need the details of Interface Rules, Queue Rules and Resource Rules which will record traffic and resource data and display graphs in winbox or web interface. The following sections will show how to create interface, queue and resource rules in your MikroTik Graphing. This configuration will be easy if you have a mikrotik dude server installed and running so that after you have add the client to the dude server you can easily pick the infrmations you need by just placing the mouse on the client icon. Interface Rule is responsible to record and display interface traffics graphically. The following steps will show you how to create Interface Rules in MikroTik Graphing. Login to your MikroTik Router and go to Tools > Graphing menu item. Graphing window will appear. Click on Interface Rules tab and then click on PLUS SIGN (+). New Interface Graphing Rule window will appear. Choose your desired interface, which traffics you want to view graphically, from Interface dropdown menu. If you want to view all interfaces’ traffic, select all from Interface dropdown menu. Put your desired IP Address or Network, which is allowed to view this interface graph in webpage, in Allow Address input field. If you don’t provide any specific IP Address, all IP Addresses will be able to view this interface graphs. First Interface Rule for Graphing has been completed. Similarly, you can create as many Interface Rules as you want and can view traffics graphically. Creating Queue Rules, you can view any simple queue traffic graphically and you can also send this graph link to your customer for his inspection. The following steps will show you how to create Queue Rules in your MikroTik Graphing. In Graphing window, click on Queue Rules tab and then click on PLUS SIGN (+). New Queue Graphing Rule window will appear. Choose your desired simple queue, which traffics you want to view graphically, from Simple Queue dropdown menu. If you want to view all simple queues’ traffic, select all from Simple Queue dropdown menu. Put your desired IP Address or Network, which is allowed to view this simple queue graph in webpage, in Allow Address input field. If you don’t provide any specific IP Address, all IP Addresses will be able to view this simple queue graphs. First Queue Rule for Graphing has been completed. Similarly, you can create as many Queue Rules as you want and can view traffics graphically. MikroTik Graphing gives facility to monitor CPU, RAM and Disk Usage graphically but Resource Rules must create to view this graphs. The following steps will show you how to create Resource Rules in your MikroTik Router. In Graphing window, click on Resource Rules tab and then click on PLUS SIGN (+). Resource Graphing Rule window will appear. Put your desired IP Address or Network, which is allowed to view resource graph in webpage, in Allow Address input field. If you don’t provide any specific IP Address, all IP Addresses will be able to view this resource graphs. Resource Rule has been created successfully. Now it is possible to monitor your MikroTik Resource (CPU, RAM and Disk) usage graphically. Bandwidth usage and Resource usage graphs that are created by MikroTik Graphing Tool. Your winbox is eligible to view your bandwidth and resource usage graphs. So, you can view your interface graphs, queue graphs and resource graphs whose rule you created before in your Winbox. The following steps will show how to view graphs through your winbox. Go to Tools > Graphing and then click on Interface Graphs tab. Your created interface rules will be available here. Click on your desired rule twice. Your desired graph will appear where you can inspect your traffic which is passed through this interface. Now click on Queue Graphs tab. Your created queue rules will be available here. Click on your desired queue whose bandwidth you want to inspect. You will get your desired bandwidth usage report graphically. Again, click on Resource Graphs tab and click on your desired resource (CPU, RAM or Disk) twice and you will find your resource usage graphs now. The best and suitable method to view your bandwidth and resource usage graphs through web interface. Your created graphs will be found at http://[Router_IP_address]/graphs. You can also send this URL to your customer and he/she can view his/her accessible bandwidth usage graphs from this URL. Okay another simple way to create a customer historical and utilization graph is by using a cacti server which runs in a VM. To add a client to a cacti server click on console. Click on add at the top right end of the page. It will take you to a page where you will enter information about the client. First step is to give the host a meaningful name. Follow by Host IP address. Check the monitor host button. On the SNMP community cactus you change it to public; this will allow you to view the graph. Chose the interface you which to monitor, by checking the box on ether1. And then the rest of the job is to click on create. With this you have a real time of every of your client and also monitor them from your base station. ← How To Implement Single IP NAT Strategy in MikroTik Router.